Above: This private waterpark is fun personified. With the lazy river, waterfalls, and spray park toys, kids of all ages would have a hard time calling it a day! 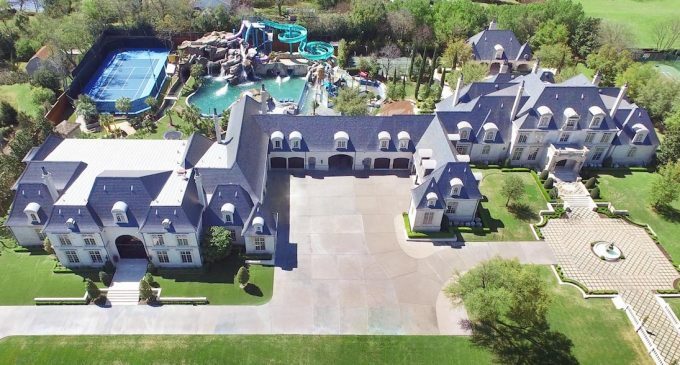 Today, it is not uncommon to find backyards that include custom pools, outdoor kitchens, luxury outdoor furniture, putting greens, tennis courts, and even water parks, complete with kid-approved waterslides and lazy rivers. Indoor or out, many of these amazing spaces rival the best showcased by popular amusement parks and luxury resorts. Before developing a cutting-edge recreational space, homeowners must consider all that is required to create their backyard oasis. Working with a talented and skilled pool designer and builder, landscape architect, or general contractor is a vital first step in realizing a long-held dream. Experts in the outdoor living industry know what permits are needed and the local codes and zoning laws; they will also have connections with other specialists to successfully complete a job. Once you have hired the professionals who will manage your project, be ready to share a wish list of ideas for your backyard oasis. Here are a few to get you started. Homeowners are happily discovering that they can appease their inner child by building a personalized backyard water park. By adding waterslides, a lazy river, splash zones, and other water park favorites, homeowners can capture the pure excitement usually found only at a distant, crowded amusement park. As the demand for personal water parks increases, pool designers are learning the ins and outs of developing and building these intricate spaces. It is important that highly skilled engineers and builders are consulted, because the correct type and number of pumps, electricity, and other controls are critical for success. Plus, these complex zones require a variety of permits and must follow a local government’s building codes. Is golf your game? What could be better than walking out your backdoor and right onto the 18th hole, complete with everything you need to improve your putting skills? Many golf aficionados find that working on their handicaps in the privacy of their own home takes strokes off their game—plus, when paired with a fabulous pool that features a swimming lane or tanning shelf, a putting green becomes part of the ideal secluded, all-inclusive recreational center. Basketball and tennis courts are two fields of dreams that many homeowners consider must-haves for their backyard playgrounds. By including them along with a swimming pool, homeowners give their family and guests a home field advantage: they will be able to work up a sweat on the courts and then cool down in the pool or under a waterfall (or hit the spa if the activity is a bit too strenuous!). No matter what type of personal playing fields homeowners decide to include on their property, however, the appropriate skilled professionals need to be consulted. Permits and zoning laws must be investigated and drawn before anything can be built, and those experts in this type of construction are the best ones to manage the production of a private athletic field. The tropics are a favorite getaway for countless people, and when they get back home, they want to recreate the relaxing experience found on the white beaches of the Caribbean or the South Pacific, complete with hidden grottos and majestic waterfalls. As a result, pool designers are seeing an uptick in the demand for lagoon-themed pools. Usually freeform in shape, these pools are perfect foundations for breathtaking waterfalls formed from natural or faux rock. These sensational water features add a sense of timelessness and enchantment while also bringing musical harmony to a setting. Whether created from natural rock or composite materials, they transform an ordinary track of land into a mystical hideaway that is far from the middle of the road. Some homeowners choose small, gently flowing cascades, while others go for the gusto, creating their own backyard Niagara Falls. Additionally, by including colorful lighting, hidden grottos and caves, and a secret spa area or koi pond, the waterfall can become the commanding focal point that will be a source of countless oohs and aahs for years to come. Today’s outdoor furniture pieces are not only more hard-wearing than ever, they are also designed to be beautiful complements to fabulous outdoor rooms and kitchens. Made of exquisite materials like teak, wrought iron, rattan, and man-made extrusions, outdoor furniture is designed to take center stage by providing a visual reminder of a home’s electric personality. There are more styles and types to choose from than ever before. Vibrant fabrics, exotic woods, and man-made materials such as recycled plastic and acrylic-based products, are crafted to stand up to rain, wind, sun, and pool chemicals. Such a wide variety of choices allows homeowners to not only make a bold statement, but also maintain the furniture’s dramatic appearance for years—or until the homeowner is ready for a change, that is! As extreme backyards become more popular, more unique and luxurious options are becoming available from innovative designers. From spectacular poolscapes to sports courts to water parks, these personal getaways include all of the items a homeowner needs to relax and enjoy outdoor living. Article courtesy of Terri Shields.